There's an old Russian proverb that says: Every day is a messenger of god. 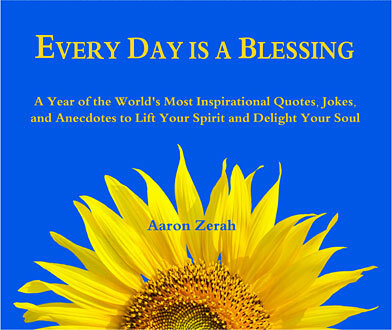 That's what I hope Every Day Is a Blessing will be for you — a daily message that lifts your spirit and delights your soul. When you look inside, you'll discover a vast array of wise sayings, proverbs, and stories from the world's great spiritual traditions and cultures. You'll also find hundreds of quotes, jokes, and anecdotes given to us by the great souls of our planet. There's everyone from Jesus to Buddha to Mother Teresa; Aesop to Abraham Lincoln to Yogi Berra; St. Francis of Assisi to Albert Einstein to Anne Frank; Martin Luther King to Muhammad to Muhammad Ali; Confucius to Shakespeare to Chief Sitting Bull; Marilyn Monroe to Mark Twain to Michelangelo; Mahatma Gandhi to Helen Keller to John F. Kennedy and Dolly Parton to the Dalai Lama. These great souls are all gifts in my life and Every Day Is a Blessing is my way to share their blessings with you. For your information and enlightenment, I've included a brief description of each of them at the end of the book in the Roster of Great Souls. Now, I'm going to quote here one additional great soul — my daughter, Sari. One morning, when she was three, she said, “Abba, I've got something to tell you.” “Okay, Sari,” I asked, “what is it?” She briefly paused, then said, “Today is… today!” May today and every day for you be a blessed one! “I am so truly thankful and blessed that your book found its way into my library, my bedside, my heart, my consciousness, but most of all my spirit. What a lovely book! It gives me a reason to get out of bed each day, keeps me positive throughout my day and inspires me throughout the year.